APHC On Tap | Consumer Focused Plumbing And Heating Blog: Heating your home: fact or fiction? Heating your home: fact or fiction? With temperatures due to drop significantly over the next few months, it can be difficult to know how to best maximise home heating for top efficiency at the lowest cost. To help you keep warm this winter without breaking the bank, the Association of Plumbing and Heating Contractors (APHC) have come up with a list of the top ten heating questions asked by customers. Fiction - It’s better to leave the heating on a constant low than set it to come on twice a day at a higher temperature. Leaving the heating on constantly uses more energy than turning it on and off, even at low temperatures. Use a thermostat to regulate room temperature and concentrate on heating the rooms you use most. However, a short burst of heating at a high temperature is also not an efficient way of heating your home. Fiction - Turn up the thermostat to heat the room more quickly. Many people think they can speed up warming their house by turning up the thermostat, but the heating won’t get to a warmer temperature any sooner. The thermostat controls the final temperature, not the speed at which the house heats up – so the end result will eventually be an overly-warm house. Fact - Bleeding your radiators does make a difference. 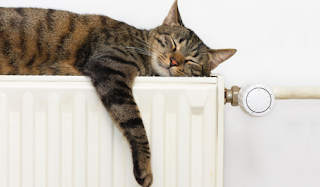 A simple way to increase heating efficiency is to make sure radiators are working at their maximum capacity. Radiators containing trapped air are hot at the bottom but cold further up, so they're not giving off as much heat as they should. Bleeding them is easy - simply put a radiator key or small screwdriver into the bleed valve on the radiator and open the valve to let out the air. Fiction - It’s more efficient to keep the water heater on all the time than heat from cold. Hot water only needs to heat up as it is being used. Heating water continuously is unnecessary and a waste of energy. Combi boilers only heat water as it’s used so you won’t be able to keep the hot water on constant. Fact - An old boiler does drain energy. According to boiler manufacturer Worcester, a boiler of 15 years old or more may be wasting as much as 30 – 40p of every pound spent on heating our home and water. Updating your heating system to an A-rated condensing boiler or oil-fired model could make your system up to 90% efficient, so if your boiler is nearing the end of its life it could be worth investing in. The Energy Savings Trust confirms that swapping an old G-rated, low efficiency boiler for an A-rated, high-efficiency model could save you around £490 a year on running costs (based on replacing the boiler and heating controls in a detached house that has gas central heating). Fiction - There’s not much benefit in turning the thermostat down by only one degree. According to the Energy Saving Trust, based on normal use this small change can reduce bills by 10%, although you’d have to have the heating on all day to see the full cost saving. But any reduction in energy consumption is good. Fact - Drawing the curtains saves heat. It's not only a mental trick of shutting out the cold, a study at the University of Salford proved that drawing your curtains at sundown can reduce heat loss by 15-17%, while drawing blinds reduces it by 13-14%. Fiction – Turn off your heating to save money when you go on holiday. To prevent frozen pipes, which can cause hundreds of pounds of damage, APHC recommends you leave some heating on, especially if it’s during winter. Setting your thermostat so the heating comes on when the temperature falls below 5’c should be enough to prevent frozen pipes. If your thermostat doesn’t go down that far, setting the heating to come on for a few hours a night would also be a benefit as it can take a long time for pipes to freeze. Fiction - Keep electric storage heaters on all the time. Electric storage heaters are designed to charge up overnight using cheaper off-peak electricity and then gradually release the heat during the day. However, many storage heaters have in-built electric panels which can be used to ‘boost’ the heat if needed. Leaving the heater on with the incorrect settings could be using the panel heaters rather than the storage heater and cost far more. Fiction – you need a special boiler to install underfloor heating. Underfloor heating can be run off all the heat sources a normal radiator can, although some systems may be suited to different heat supplies such as heat pump systems. Underfloor heating can be 15-20% more efficient than radiator systems, as heat is concentrated in the bottom space of a room. Now you know which commonly held heating beliefs are myths and which are must-dos, make you put the knowledge to good use to heat your home efficiently and cost effectively this winter.